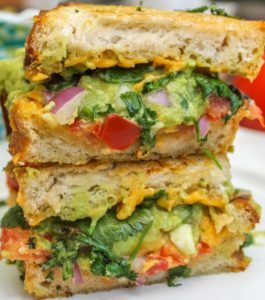 Perhaps not a traditional South African recipe, but we do love a good snackwich and after trying this at home this past weekend, I knew it had to be shared. It would be selfish of me not to! So if you like bacon, avocado and melted cheese – that’s a yes, yes and yes – then this is well worth a go. I’m very particular about my avocado and NEVER have it warm, but it works really well here and it doesn’t get bitter at all. Start by crisping the bacon, either in the pan or you can put it under a hot grill for 5 minutes per side. Set it aside, allowing oil to drain off into a paper towel once done. TIP: If you’re grilling the bacon in the pan, be sure to get your skillet hot and ready. Butter the outsides of the bread. Tip: I usually butter one slice and lay the buttered side on top of the other, so once I put the first slice in the skillet, I can butter the second slice. Once buttered, place half of the cheese mixture onto the unbuttered side, followed by the bacon, guacamole and chips and finish off my adding the rest of the cheese. Top with the second slice, buttered side up and toast until golden brown and the cheese is melted. This should take around 3 minutes a side. Quick, easy and super delicious!